Aboard the transporter Sky Lark, a mercenary walks into an overrun lab. A trilobyte-ish Zen alien fires an energy bolt at her. This is her fifth time attempting this, though, so she knows to expect that – and the next alien approaching on her left too. This scenario was way more exciting when it first happened. The role-playing game Cybermercs: The Soldiers of the 22nd Century does suffer from how often players repeat themselves, both by replaying the same sections and by encountering similar kill-em-all situations throughout. Those locations like the Sky Lark and their beat-up metal fatigue sensibility still make Cybermercs intriguing. Cybermercs envisions a bleak future strained by alien attacks and interplanetary resource wars. With no option to retreat, the Governor General of the besieged human colonies has offered to outfit mercenaries with the most advanced equipment available to defend what remains. You play as one of these mercenaries who earns their keep by killing aliens, freeing hostages, and, essentially, doing the colonies’ dirty work. 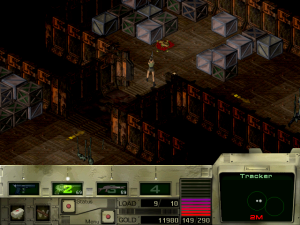 Details of the conflict turn up between missions, but largely, this is an excuse to throw the player into industrial settings to shoot things. In each of the game’s fifteen missions, you need to eradicate an alien presence from a factory, ship, or installation (among other side objectives). Enemies move quickly and can easily surround you, so combat tends to be a trial-and-error affair. Open a door, check your radar to see how many creatures are approaching, pick a weapon with enough ammunition, and inch forward while shooting anything in the way. If you survived, grab any bullets and health items lying around that fit in your inventory. If you died, try again with better knowledge of what to do. After the mission, you can spend your reward money on new supplies, item repairs, or upgrades to your character’s traits. It’s all standard, repetitive action-RPG fare. As you creep through abandoned machine rooms, rapidly clicking on alien worms and zombie dogs works on an almost hypnotic level. The game doesn’t offer much surprise (except for the extremely fun armored robot vehicles that appear further in), but occasional new enemies and obstacles keep the simple premise enjoyable for a while. A greater part of the appeal comes from the environmental aesthetics. Those boilerplate dungeon-crawl missions are fine, but Cybermercs‘s ruined industrial sites give the game a dinginess that stands out. Every corner feels claustrophobic and broken, especially when new technology like a teleporter sits in a rusted, bombed-out storage room. Or when spinning emergency beacons light up a derelict munitions plant. 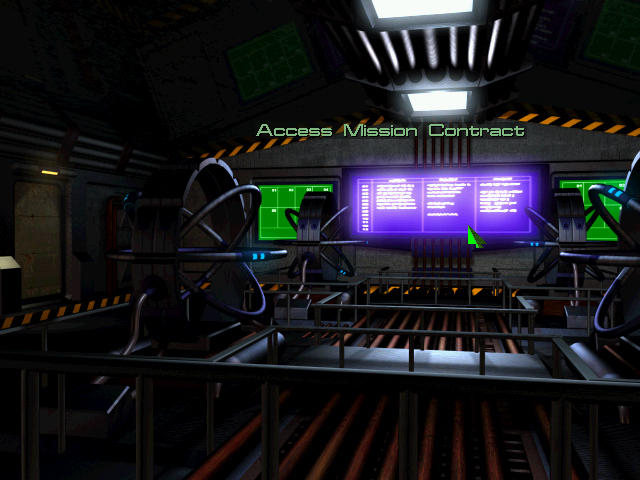 Most compellingly, the intermission menus, presented as an explorable mercenary base, convey a militarized world that abandoned any attempts at maintenance years ago when it was no longer expedient. The grunginess makes the action feel more like an Aliens-adjacent thriller, improving it by couching its frequent shallowness in an atmosphere of creaking, dangerous, half-functional junk. Stashing excess inventory items just feels cooler when you store them in a motorized locker in your dilapidated underground personal quarters. 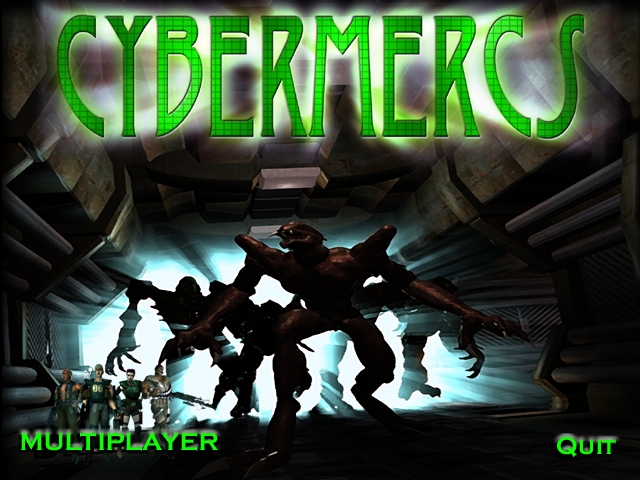 Cybermercs is nearly a standout example of the pre-rendered graphical style embodied by similar games like Diablo II. Unfortunately, the densely designed wreckage often obscures more than it contributes. Pipelines add wonderful, cramped detail to scenes, for instance, but they hide enemies and items too well; rooms with pipes sometimes even need glowing arrows to indicate where you can walk. As much as it fits the dark sci-fi horror theme, low visibility and frantic shooting mix poorly in practice. 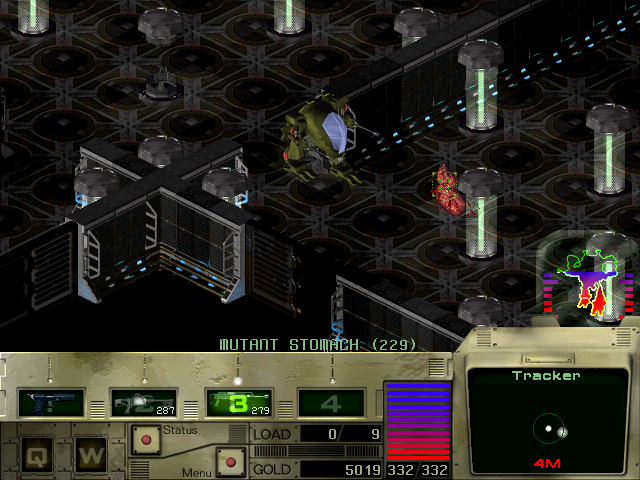 At least through the second or third time at each encounter, Cybermercs retains the pleasures of plowing through an infested futuristic work site. Its corroded aesthetics boost the occasionally rote experience and distinguish it from other action-heavy role-playing games. Like the awesome robot armor bringing some energy mid-mission, it adds style to a battered idea. Cybermercs‘s credits roll ends with an ominous warning about “the judgment day one year from now.” No further clarification is offered. ?! ?